This article describes how to create a JForex-SDK project as an Apache Maven project in NetBeans IDE. 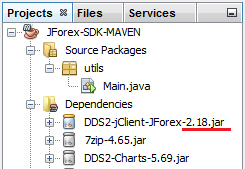 The main advantage of using Maven is that in order to switch to the latest JForex-SDK version one only needs to change the DDS2-jClient-JForex version number in the pom.xml configuration file rather than download the zip file and import it as a new project. See Strategy development in NetBeans for more information on working with NetBeans and JForex-SDK. Before creating a Maven project in NetBeans, one needs to verify if NetBeans already has Maven plugin installed. For the latest versions of NetBeans the Maven plugin comes bundled in by default, as it is in our case. For older NetBeans versions one can install the plugin by choosing Tools -> Plugins -> Available Plugins. If you are using proxy to access the internet, then the proxy settings should be configured in NetBeans through Tools -> Options -> General -> Proxy Settings. Make a new file, name it pom.xml and paste the to it the upper given contents. Put this file in an empty directory. Open NetBeans and press Ctrl+Shift+O (or choose File -> Open Project) to open a new project. Locate for the directory in which the pom.xml file is located. NetBeans will automatically recognize this directory as a Maven project. Select the project and choose Open Project. NetBeans will create a new Maven project called JForex-SDK-Maven. Right-click the project in the Projects window and choose Clean and Build. NetBeans will build the project. One can expand the project node and see that the project already has dependencies. These dependencies (libraries) are stored in the public Maven repository of Dukascopy. We need to create a folder where to store java packages and files for the project. Right-click the root node of the project and choose New-Other. NetBeans will open a New File wizard. Choose Other from Categories and Folder from File Types. In the next step of the wizard name the folder src. Choose Finish to create the folder. Expand the root node of the project in the Projects window. One can see that the NetBeans has added a new folder called Source Packages where one can create java packages and files. To run a strategy in NetBeans we will create a new java class called Main. At first, create a package where to store the Main.java class. Right-click the Source Packages node of the project and choose New-Java Package. Give a name utils for the package and choose Finish. A new package is created. Now, create a class which will be used to run jForex strategies (demo). Right-click the utils package node in the Projects window and choose New-Java Class. Type Main for a Class Name and choose Finish. * Copyright (c) 2009 Dukascopy (Suisse) SA. All Rights Reserved. *  list of conditions and the following disclaimer. * EVEN IF DUKASCOPY HAS BEEN ADVISED OF THE POSSIBILITY OF SUCH DAMAGES. Find and replace MY_USERNAME and MY_PASSWORD with real ones. Right-click the project node in the Projects window and choose Clean and Build. As mentioned in the introduction, the main goal of using Maven projects is to keep the dependencies of a Maven project up to date. Till this point of the tutorial, we used version 2.18 of JForex-SDK.